Designed to maximize performance, a housed unit combines the bearing, housing, seal and locking system into one device for easy installation and operation. Shaft support for radial, thrust or combination loads. Available in cast iron, steel, polymer and rubber. Operational impact, space constraints, vibration, conductivity and presence of corrosives are common factors for consideration. 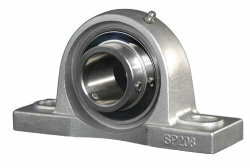 The Self aligning characteristic is achieved via the spherical shape of the outer race of the bearing insert. These are the most common type of housed units and have the plane of the mounting base parallel to the shaft. Pillow blocks are used on vertical or horizontal surfaces or on an inclined plane and have 2 Bolt holes. Flanged units are usually mounted on vertical surfaces where a shaft passes through the machine frame at a right angle. 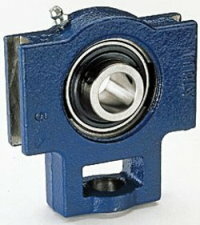 A four-bolt mounting is the most common. Where mounting is restricted, two- and three-bolt versions are available. 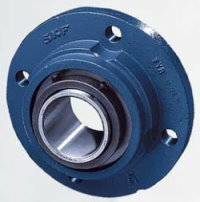 Flanged units are supplied in multiple series (standard and heavy duty) and different materials. This style is recommended where shaft alignment and belt tensioning devices are required. The most common application is conveyors. Frames for take-up units provide side or top mounting. Complete take-up units with frames are available for both horizontal and vertical adjustments and top or side mounting.